What is the Quick Launch? 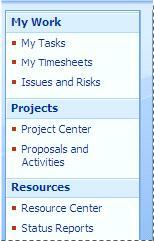 The Quick Launch is the pane that is displayed on the left side of Microsoft Office Project Web Access. Use the Quick Launch to access Office Project Web Access features such as tasks and timesheets. Note: The Quick Launch doesn't appear on every page. It is not displayed on some site administration pages, such as the Site Settings page, and the pages on which a site administrator creates and edits lists, libraries, and project workspaces.